Every once in a while I happen to find myself in a public network, where all access besides HTTP and HTTPS is blocked by the firewall. This is extremely inconvenient, as I routinely need to access SSH, VPN or other ports besides HTTP(S). Over time I have developed a reasonably fast and simple way of overcoming the restriction whenever I need it. Let me document it here. 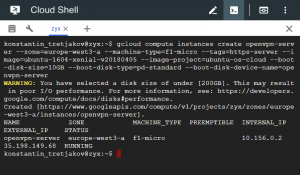 Even if you do not have any serious use for a cloud provider, the cloud shell is one good reason to get an account at the Google Cloud platform. Because whenever I find myself locked out of SSH behind a paranoid firewall, I can still SSH into any of my servers via the cloud shell. This works even when your access is limited to an HTTP proxy server. Once upon a time there was a great service named koding.com, which also provided free access to a Linux console via HTTP. Unfortunately, they have changed their pricing model since then and do not seem to have any similar free offerings anymore. If you know any alternative services that offer a web-based shell access to a Linux VM for free, do post them in the comments. Sometimes SSH access offered by the cloud shell is not enough. For example, I would often need to access the company's VPN server. It runs on port 1194 and in a properly paranoid network this port is, of course, also blocked. The way to sneak through this restriction is the following. Launch a server in the cloud, running an OpenVPN service on port 443 (which corresponds to HTTPS). Even the most paranoid firewalls would typically let HTTPS traffic through, because otherwise they would block most of the web for their users. Connect to that VPN server and tunnel all traffic through it to the outside world. Now we are free to connect anywhere we please. In particular, we may open a VPN tunnel to the company's server from within that "outer" VPN tunnel. At this point I would sometimes SSH into a machine behind the company's VPN and never cease to be amused by the concept of having a SSH tunnel within a VPN tunnel within another VPN tunnel. Let us now go through all these steps in detail. (obviously, detailed documentation of Google cloud functionality is way beyond the scope of this blog post. All the necessary references and tutorials are rather easy to find, though). You may play with some of the settings passed to the command above, however the choice of the ubuntu-1604-*** image is important, because the script from the next part was only ever tested on that Linux version. The chosen machine type (f1-micro) is the cheapest and should cost around 5 euros per month (if you keep it open constantly), or a matter of cents, if you only use it for some hours. (holding "shift", scrolling and clicking the mouse helps). 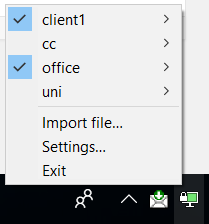 We then create a new file (on the local machine), name it client1.ovpn (for example), paste the copied text and save. That's it, we have successfully set up an OpenVPN server running on port 443. Type exit in the cloud shell to log out of the server as we don't need to configure anything there. 4. Once you've done it, the OpenVPN tray menu will offer you a "Connect" option (or a "client1" submenu with a "Connect" option if you have other connections configured already). Click it, observe the connection dialog, wait until the tray icon becomes green, and congratulations, all your traffic is now tunneled through port 443 of the cloud machine you launched some minutes ago. You may verify the effect by googling the words "my ip". You are now also free to connect to any ports or services you need. As I mentioned in the beginning, having freed myself from the firewalls of a paranoid network administrator, I would then sometimes need to connect to a corporate or a university VPN. This happens to be surprisingly easy (this part is, however, Windows specific - I am not sure how an equivalent action should look like on Linux or Mac, although I'm sure it should be possible). OpenVPN uses a virtual network tunnel adapter to forward traffic. Initially it only installs one such adapter, but if you want to run a tunnel within a tunnel you will need to add a second one. This is done by simply running C:\Program Files\TAP-Windows\bin\addtap.bat with administrator privileges. It only needs to be done once, of course (unless you need to run a tunnel within a tunnel within a tunnel - then you need to add a a third TAP adapter by running addtap.bat again). Now running a VPN within a VPN is simply a matter of asking OpenVPN to "Connect" to VPNs in the appropriate order. As we are already connected to client1, we simply connect to another profile without disconnecting the first one - this will happily forward a tunnel through an existing tunnel. Fun, right? That's it. You are back at the mercy of the firewalls.